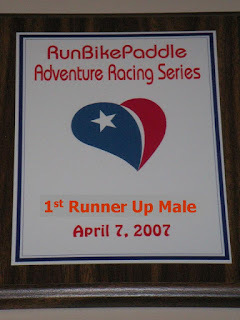 Once a source of "Not all you want to know about Texas Adventure Racing," but now just some "leisure" adventure through the eyes of "The K-SPoT"
Mo and I get there pretty early, but Double Lake is already filled with racers. Mo had specific cheffing duties, so she was busy with her own thing for most of the race. I just went on my own merry way and set up our TA. Rick predicted that Tom would show up at 8:59, a minute before race start. While it wasn't that bad, he did arrive a bit later than we had agreed to. No matter--I just got our spot ready and then went on a short warm-up bike ride through the trails. By the time I got back, Tom was there, so I got him all caught up and then we went on a short warm-up run. With the cold temps, I could use all the warming up I could get. We discussed strategy during the run, being MOAT was again there as the team to gun for. It was Carlos and Chris, trying for a repeat from last year. Considering they won the race last year despite a broken chain and having to run one of the bikes in during the bike portion, we had our work cut out for us. We knew we would just blow ourselves up trying to keep up with them for 10 seconds during the run, so we decided to run our own pace and then hopefully we could make some time on the bike. Team Tommy was also there, so we had to be aware of them at all times as well. He was racing with Ali. As for the coed division, Ashley was racing with a guy I didn't know and Bobby and Helena would represent as the top team from HART. It looked to be a very exciting race, which it turned out to be. During the pre-race meeting, we were told to put our passports inside a bin. Unfortunately, Tom didn't leave ours on the lanyard I gave him, which would turn out to be somewhat critical. We went through the race instructions. While discussing the mandatory PFDs for the paddle, Rick slips in a comment about not being sure if they would be mandatory for when in the water, hinting at a swim leg. Crap. I was hoping he was joking...thankfully, he was. It was so cold we probably would have gotten hypothermia or something! Once the meeting was done, Rick announces that the race will start in 30secs. WTF?!? Okay, so we quickly decide that we don't have to bring water since it was a short run to reclaim our passports out of the bin. We quickly line up and as soon as the prayer was said, the horn goes off. MOAT sprints off, verbally goading Tom. I laugh out loud as to say, "whatever!" We obviously let them speed off to a crazy lead while we remain neck and neck with Team Tommy and Ashley. Towards the 2nd half of the run to the passport bin, close to the park entrance, we start to pull away from the other teams. Tom and I are pacing each other pretty well and I'm getting close to my limit, but am able to keep calm. We get to the bin a few minutes after MOAT, but Tom is having trouble finding our passport. That's when I blurt out, "you didn't keep it on the lanyard?!" Oh well. Team Tommy finds theirs quickly and right before Ashley finds theirs, I look down and spot it. 306. We sprint back towards TA. But I then realized that we didn't have to go all the way to TA to start the first run since it was on the way. That's when I was worried because we had decided not to bring a water bottle. I figured I would be okay as long as I rehydrated on the bike. We're cruising pretty nicely down the double track trails and we catch back up to Team Tommy and run side-by-side for a couple of minutes. The trail was getting narrow, so I decide to put on a burst to get in front. It works and I actually feel really good, so I keep the burst pace on for a little longer. This is where we start to gap them. We get to the turnaround, punch our passport, and head back to TA. Coming into TA, we seem to have a minute or so lead on Ashley and then Team Tommy. We quickly transition onto our bikes and head into the trail. This is where I want to mash hard and try to gain back some time on MOAT, but Tom is admittedly not as fast on the singletrack. Plus, he apparently scratched his cornea somewhere along the way and that slowed him down a bit more. I was chomping on the bit, but I exercised patience. As long as Team Tommy didn't catch up to us I was fine. The ride is pretty clean, despite the rain and hail, and we make it to the final road crossing and Rick is suprised to see us as he yells, "30 seconds!" Wow, we were that close?! Something must have happened. We keep going, hoping for the best. A few minutes into the last section and I start hearing voices. I slow down and ask if Tom said something. No. Usually that means someone is coming up on us--I'm pretty good at this after a few years of mtb racing. We get to a sharp turn right before the end of the trail and it is confirmed like a Don King perm--Team Tommy has caught up! Crap. I usually try to kill on the bike so I won't have to rely on my anemic running to keep in front, but I had no choice here. We get back to TA and we are only seconds in front of Team Tommy. What's more amazing is that we actually see MOAT leave TA on the hike-n-bike, meaning we're not too far back from them either! We transition into running shoes and head out. Tom runs first, up to the gate of the dirt road--its the same route as the run leg. I reluctantly get off and run...reluctant because I don't know if I can keep up with MOAT or even keep Team Tommy at bay. We are able to keep steady at 15km/hr (Tom's bike) so that seems to be fine for now. Carlos, about 30 seconds in front of Chris, who is on the bike (WTF?!) encourages us again. We get to the turnaround, punch, switch riders, and are off. We are able to spread our lead a bit, but on the return trip, they make the time back up. That's when Tom says, go a bit faster. 16km/hr. Its working, but I have to switch out again at the gate. We do fine on the last stretch and keep our lead. 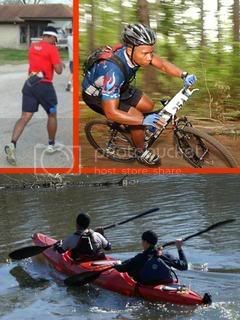 We run to the paddle, similar route as the Solo race, with sevy seats in hand. I'm barely keeping up with Tom, but I do it. We get to the put-in and it seems that the paddle gods start to conspire against us. (1) the boat is flat, (2) Tom's seat goes flat, and (3) my paddle is two teaspoons taped together. I don't realize that my paddle is different from 90% of the other paddles until after I take a couple futile strokes. I finally scream, "whatthefu...?!?" I don't realize it yet, but Tom has more distressing problems of his own. He has to deal with most of the flat boat since he is in the back, and he finally decides to sit in the kneeling position because the seat is now useless. Wonderful--we actually almost spin. I'm thinking, "not this way, we can't lose to Tommy this way!" Somehow we get it all back together and we make some headway. I can hear the flat sevy dragging all kinds of water, but I keep digging. We reach the buoy and somehow we are holding off Team Tommy. However, they did make most of their time on us on this leg. The final sprint to the finish. It seemed that I was more in a hurry than Tom because I was in front telling him they were just behind us. I think in his mind we already had it sewn up. Actually, his legs had gone numb from kneeling that whole time in the boat and they started to kick in once we got to the other side of the lake. I drafted off of him and in no time we were back to the main road leading to TA. We had done it, with seconds to spare. Mo had taken time out of her cooking duties to welcome me into the finish. We scream our team number and Tom follows up by telling them that they need to take our passport since no one at the finish took it when we came in. Team Tommy (and Ali) finish and says, "freakin' Kenny!" Funny. We finish the course in 2hrs. Meanwhile, in the coed division, Bobby and Helena are able to get close to Ashley, but they our out of 1st by 15secs! So close! I quickly go into the lodge and make use of the wonderful fire that Mo had made. The hotdogs were good as well. This is where I find out from Carlos that Chris forgot his bike shoes on the bike, which was the most likely reason we were so close to them! Oh well. We wait for people to finish then we claim our awards. Good times, good times. After quick well-wishes and goodbyes, Mo and I jam outta dodge so I can get a hot shower! Overall, a wonderful race with wonderful volunteers and wonderfully run. Look Out MS-150, Here Comes the NP-140!